The Duggars are back - and they have a lot to catch up on! Erin Bates got married last fall, then Zach Bates in December, and with Jill Duggar already engaged (but has not yet even met Derick on the series), it'll be a busy season! Over in Washington, D.C., Anna is homeschooling four-year-old Mackynzie, and it looks like the rest of the Duggars will be heading East for another visit - perhaps even Thanksgiving or Christmas! Still, each family member takes life at his or her own speed, and there are bound to be little moments that are just as important as graduations and weddings! Michelle and Jessa go to check out Ben's family for the weekend, and in preparing, the older girls (plus Joy for once!) talk about what will be changing in the household. John-David flies them down there, and the 200-mile flight takes them 40 minutes. [John-David really does try so many different things!] Jessa and Ben go on a double-date with his parents while Michelle watches the other kids. [normally, you'd think it woudl be awkward to watch a bunch of strangers' kids, no?] The Seewald extended family comes over for a potluck meal as well. [it was very cute that Jessa thought Ben genuinely wanted to discuss theology at first.] Meanwhile, JimBob takes the kids out for a pizza buffet. Jill and her group (JoyAnna, James, and Jennifer) make pickles. Anna puts together a playhouse for the kids, and has started homeschooling Mackenzie. Anna demonstrates worksheets with Mackenzie. 19 Kids and Counting "Wedding Bells?" 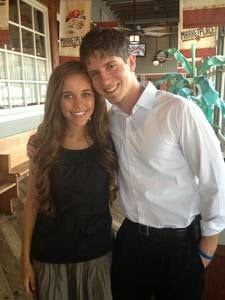 (S08E04): Ben and his mother join the Duggars on a road trip to Tennessee for Erin Bates' wedding. [is "Chad" normally a nickname for "Charles" ?] Because Erin isn't the greatest cook, the older Duggar girls (sans Jessa) decide to put together a gag gift about the woman's poor skills in the kitchen. [the fire extinguisher was a funny touch!] Jinger starts taking over the packing, which Jessa used to help with, but at least the number of kids is a little smaller - Joy Anna has started packing for herself now.